Note: Other past Super-Bowl favorites have included Beefy Super Bowl Sliders with Pimento Cheese and Chipotle Chili Chicken Skins, divine, buttery Chili-Lime Chicken Wings and Teriyaki Meatballs. Lest you need reminding, Super Bowl XLVI, hosted in Indianapolis this Sunday evening, is where the NFL championship will be decided, with the New York Giants squaring off against the New England Patriots. Forget the offensive and defensive strategies; I’m looking forward to the whacked-out, weird and wildly entertaining commercials. Past favorites include cowboys herding cats, stock-trading babies and the ongoing saga of the Budweiser horses. Usually commercial breaks are my cue to retreat to the kitchen and rustle up a snack, but not so during Super Bowl. 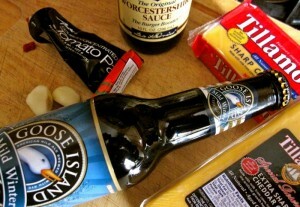 Therefore I’ve been on the lookout for a recipe that would complement our favorite brews, be easy to make and to serve. 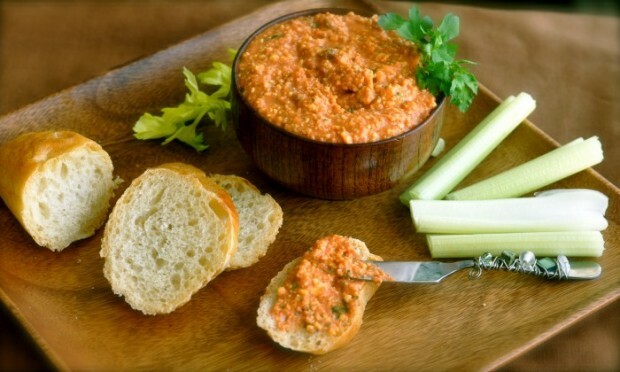 I friend of mine, Arlene Shy, shared the perfect nosh: a recipe for a pub-style Cheddar-Beer Spread she’s been serving at parties for years. She said it’s a cinch to whip up, can be made a couple of days in advance and is usually one of the first appetizers to disappear. Arlene knows a thing or two about entertaining; she was head of Reader Services at the University of Michigan Clements Library for 27 years and hosted hundreds of receptions. Arlene thinks the recipe originated from a mid-1960s Colonial Williamsburg Cookbook. The main changes she made were processing the cheese instead of grating it, and substituting garlic paste for the garlic salt. In the spirit of reinvention, I substituted fresh minced garlic for the garlic paste, added parsley and scallions, and used 3 tablespoons less Worcestershire than her recipe called for — I wanted to highlight the ale. I described the spread to Michelle Zajac, Arbor Farms beer and wine consultant, and she selected a Goose Island Mild Winter Ale, which was an excellent choice. It contributed zip and soft spice with flavors of caramel, malt and rye, without overwhelming the spread. 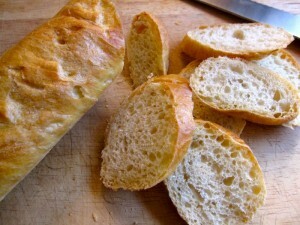 I choose a more dense baguette with a crisp exterior for serving with dips and spread. While shopping, I also picked up a locally-made Jeff Renner baguette. I love its crisp dense flavor, and it’s perfect for serving with dips, since gaping holes throughout the bread are almost nonexistent — the ultimate choice for making crostini, as well. According to an Ann Arbor.com article, Renner uses less yeast than other makers of artisan breads. He also underkneads the bread so the gluten doesn’t break down and allows the dough to rise 18 hours before baking. Several celery sticks for dipping rounded out the recipe. Pour 1/4 cup of beer in the bottom of a food processor. Top with Cheddar chunks, tomato paste, garlic and 1/2 tablespoon Worcestershire. Pulse processor, gradually adding beer and checking consistency, until mixture is spreadable but not too soft. Stir in scallions and parsley, if using, and additional Worcestershire sauce to taste. Put cheese in a decorative mold or crock; refrigerate at least six hours, and up to 48 hours before serving.